Will Philly's new video kiosks damage the city's historic brand? 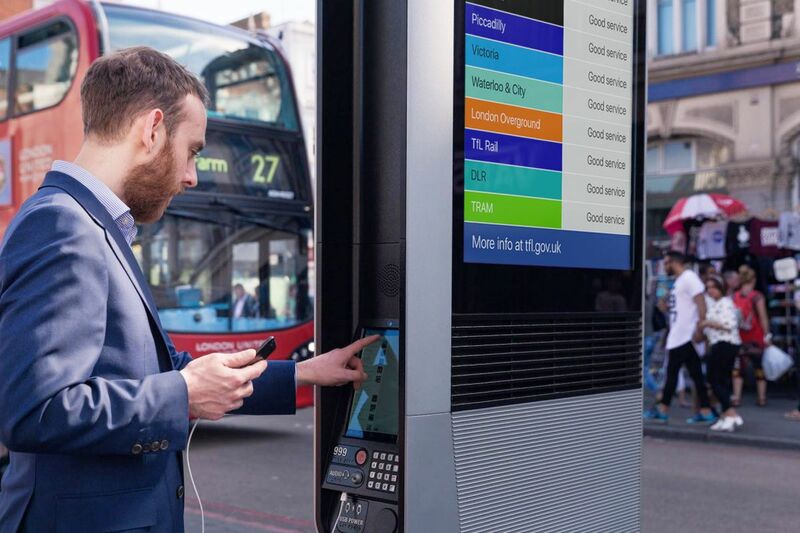 You can call, search for nearby funspots, check on bus times, and watch commercials on a Links kiosk like this one in London’s Camden district. Hypnotized or appalled by all the flickering images on cell phones and the growing number of advertising video signs illuminating the sides of bus shelters and rooftops of Center City buildings? Signs are good that you'll have even more to gawk and gasp at, as SEPTA rolls out video screens beaming on buses and eventually subway platforms. Sleek, TV-enhanced information kiosks will also start popping up on city sidewalks in the months ahead, assuming that the Philadelphia Art Commission's current "conceptual approval" evolves into full-fledged assent. The full-color LCD screens on new SEPTA buses will serve up "real time" location tracking and arrival times, plus news headlines, weather reports, and advertising. One of those zingy bus visuals will be behind the driver and another will be on the ceiling mid-bus. The first 35 of an eventual 525 new buses are "rolling out daily from the Callowhill depot," said Ron Hopkins, assistant general manager for Vehicles Engineering & Maintenance. Also coming are quieter and cleaner electric-powered variants, with similar TV on board, he hinted. LED signage tracking train arrivals is likewise in the works for the Broad Street Subway and the Market-Frankford El, said Bill Zebrowski, SEPTA's chief information officer. Intersection, the firm behind this effort, also holds a 20-year contract with the city (awarded in 2015) to design, decorate, and manage Philadelphia bus shelters and "street furniture." Most notable in the latter realm are their multi-screen sidewalk kiosks "conceptually approved" this month by the Philadelphia Art Commission and endorsed by the mayor and the city's Office of Transportation and Infrastructure Systems. Intersection "hopes and expects" its localized, LinkPHL-branded sidewalk kiosks, which are now being fine-tuned, will receive final approval from the Art Commission "on or around Nov. 1," said Stacey Levine, Intersection vice president of communications. Each one measures 11 inches wide by 35 inches deep and looms 9.5 feet tall, with bright color video screens on both sides that are easy to spot from a distance. Link kiosks first won over city residents — now 2.7 million registered users — in New York's five boroughs as a replacement for disappearing pay phones. The kiosk provides a walk-up, tablet-based terminal where a passerby can make a free, domestic voice-over-internet phone call using the stand's on-board microphone and speaker setup or, for privacy, your own plug-in headset. Alternately, two USB ports are available for charging and chatting on your mobile phone. More of a texter than a talker? These kiosks also function as a free-access, high speed (1 Gigabit) WiFi hot spot — with a signaling range of up to 300 feet on the ground and reaching "as high as 21 stories tall to a glass-walled New York office building across the street," Levine said. The plan is to space the kiosks here in Philadelphia — initially 80 on Center City and University City sidewalks and 20 more in other locations — "so that once your device is registered on our system, you can walk down the street, have it hop automatically onto the LinkPHL WiFi when you get in range, then not lose your connection as you move on to the next hotspot," Levine said. Communications are encrypted using Hotspot 2.0 security technology. With some of these stands likely to be in the historic district — a small bunch already are in London — it's appropriate that the kiosk's touch screen tablet offers a limited menu of touristy information in multiple languages and Google Maps assistance. But the info screen won't be a haven for time killers. Can't watch YouTube videos on it or blast an angry email to your landlord. What about the kiosk's money-making, glow-in-the-dark bookends? There will be no ignoring those weatherized and vandal-proofed 55-inch LCD TV screens, flipped on their sides to beam a steady round of 15-second-long commercials, public service announcements, art and culture imagery, and updated transit information. At a hearing this month, Scenic Philadelphia Director Mary Tracy argued that "we are already at a saturation point with advertising. … It's just one more crack in Philadelphia's beautiful landscape." And in a PlanPhilly posting, longtime urban critic and Trophy Bikes PHL shop owner Mike McGettigan slammed the kiosks as "repackaged, brighter billboards" that would do "damage to the city's brand." But the city — which will eventually earn 50 percent of the ad revenue (with a minimum annual payment of $450,000) — believes the developer's vow that the advertising content will be sensitively handled, not overwhelming. And that the signage won't distract drivers. These multi-faceted communicators will be a flag waver for Philadelphia's Smart Cities initiatives. "Links are designed to react to ambient light and adjust brightness accordingly from day to day and day to night," noted city spokesman Mike Dunn. Intersection will work with the city "to ensure optimal placement of kiosks to minimize unwanted light. Links are installed in historic areas in both London and New York City … with great respect for the existing infrastructure." SEPTA is taking the high road, too, with its on-the-bus, commercial serving displays, said chief press officer Andrew Busch. "Our general policy is to avoid any issue-oriented or political advertisements." Anything that could cause a stir? "Right."